Royal Eijkelkamp makes a worldwide difference by developing, producing and supplying solutions for soil and water projects. Royal Eijkelkamp is involved in soil and water projects all over the world within the themes of Land degradation, Food security, Urbanisation, Pollution, Land development and Natural Resources. Royal Eijkelkamp turned to BIS for complete advice on a new, modern boardroom in their office building in Giesbeek. 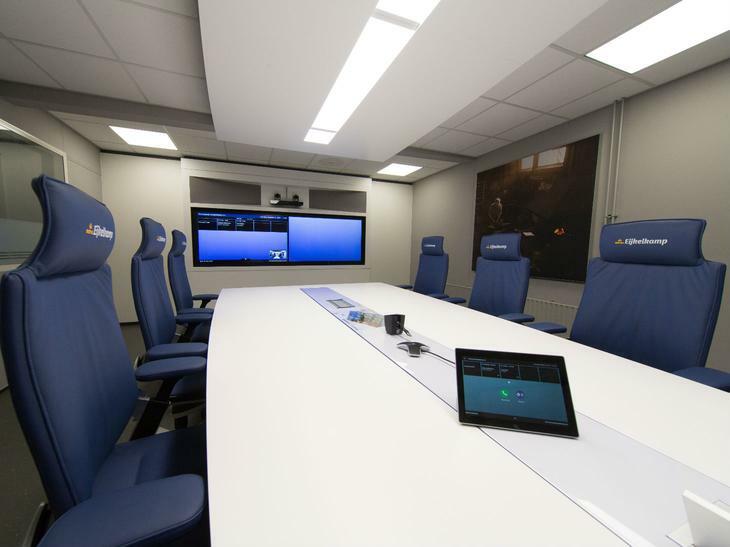 Due to the fact that Royal Eijkelkamp is represented in more than 70 countries worldwide, there was a strong desire within the management team to accelerate and improve sharing of knowledge, collaboration and decision-making by integrating video conferencing into the new boardroom. The solution to be realised by BIS had to be cross-border, both literally and figuratively. In order prepare for the future as much as possible, BIS’s consultants recommended– in addition to the advanced video conference solution with double cameras - a ClickShare solution for wireless presentation. Barco ClickShare allows content to be shared wirelessly on the central displays from any device. The displays, cameras and all peripherals are integrated into a customised pre-wall. Moreover, the additional connection options and a handy touch control panel are integrated into the table. In addition to the beautiful boardroom, an inviting lounge has been designed and realised, equipped with a presentation screen and refrigerator to make the meetings as pleasant as possible for guests. 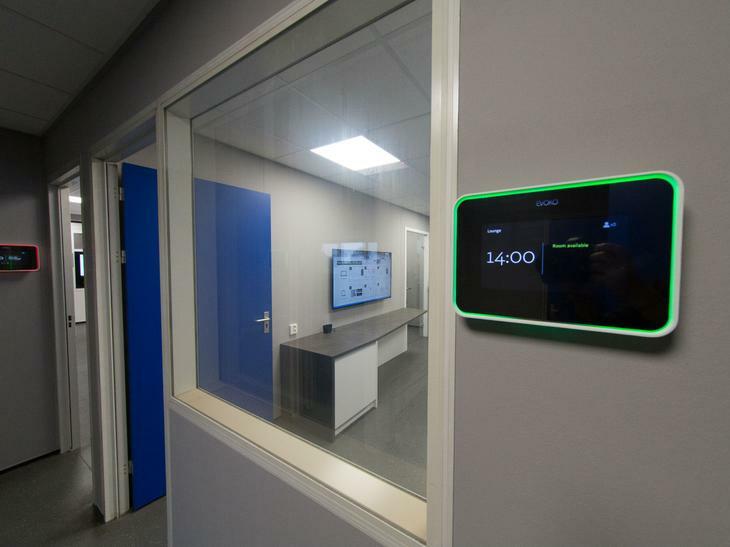 The colleagues at Royal Eijkelkamp were already familiar with Skype for Business, which made the installation of a Microsoft Surface Hub in the showroom a nice addition. This enables colleagues to work together with the user-friendly and familiar software, both internally and externally (internationally). Royal Eijkelkamp’s decision to choose BIS, was a combination of diverse elements that gave the preliminary process additional content and colour. In addition to the professional advice, the total approach, the pleasant personal contacts and the eye for detail, two other decisive elements took part. First of all, the beautiful renderings with which the BIS interior architects gave a perfect presentation of the end result in the preliminary phase. In addition, – and no less important – the possibility of purchasing the whole as-a-service solution, where BIS financed the entire solution (incl. installation, SLA etc.) and Royal Eijkelkamp pays a fixed monthly fee for its use. With all the benefits that this entails. Would you also like to optimise the collaboration in your organisation with interactive collaboration solutions and wireless presentation systems? Please call BIS on +31(0)180 - 486 777 or use the contact options on the right.